Goodwill stores are modern, clean and bright. Each provides an ever-changing stock of affordable clothing, furniture, accessories, household items – even new merchandise. See examples of our value pricing HERE! All stores accept your donations, including large furniture items. You’ve never seen Goodwill stores like these before! 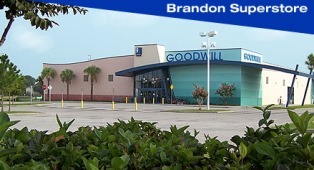 Located in Brandon, St. Petersburg, Oldsmar, Wesley Chapel, Spring Hill, Lakeland, Trinity and Ocala, Goodwill’s beautiful superstores offer more than 15,000 square feet of bargain-hunting. Spacious, clean and bright, our superstores offer a very pleasant shopping environment. Goodwill outlet stores sell deeply discounted merchandise that has been rotated out of our retail stores after a period of time. Most purchases are weighed at the checkout registers and priced by the pound, depending on the merchandise category. Furniture is flat-priced. Prices are posted inside the outlets, which are located in St. Petersburg, Lakeland and Ocala.